Benguerra is an island that forms part of the Bazaruto Archipelago, and is the second largest of the group. There isn’t an abundance of accommodation options, which fortunately allows for a peaceful holiday, uninterrupted by crowds on the beaches and loud night time activities; because Benguerra is not that type of destination. Privacy and opulence is what they offer, and proudly so. Accommodation on the island of Benguerra has been designed for maximum appreciation of its beautiful unspoilt white beaches and crystal clear cerulean seas. The option to stay in a villa hand-built amongst indigenous flora, a few strides from the beach, is by no means the rustic choice. 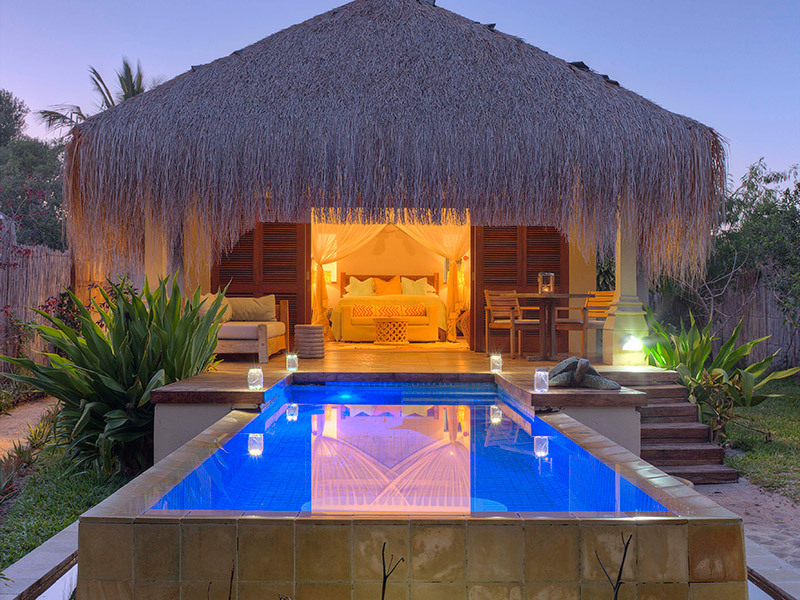 Comfort and seemingly effortless luxury is a service priority by staff for all guests staying on the island. No matter where you choose to stay, relaxation will find you, be it a villa that includes a private plunge pool, a personal chef, and a private walkway to the beach; or one that encourages you to shower under the stars after a day of snorkelling or diving, or tan on a sun lounger around the sparkling lodge swimming pool. You even have the choice of spending the morning being pampered with a full body massage at a spa; expect nothing less than clean beautifully designed and air-conditioned rooms, and unobtrusive personal service when deciding on accommodation on Benguerra.